Vitamin B6, riboflavin (vit. B2), niacin (vit. B3) and vitamin C contribute to the normal functioning of the nervous system. Neurozan is available in the UK from Boots, Holland & Barrett, Waitrose, independent pharmacies and healthfood stores. Alternatively you can order online here. As with other food supplements, seek professional advice before use if you are pregnant, breast-feeding, under medical supervision, suffer from food allergies, or are allergic to any of the ingredients. If you are taking anticoagulants do not take Neurozan except on the advice of a doctor. This product contains iron, which, if taken in excess, may be harmful to very young children. Why has Neurozan been developed? Can Neurozan be used simultaneously with medications? How many capsules does one pack of Neurozan contain? How and when should Neurozan be used? Are there any undesired side-effects whilst taking Neurozan? Is Neurozan recommended with any other Vitabiotics product(s)? "I don't usually write reviews but I thought this product deserved one. I took one tablet yesterday afternoon and no exaggeration I noticed later that I was feeling sharp and alert! What a great product, as I have said, this will help!" 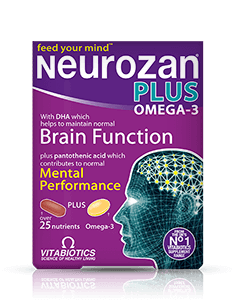 "Marvellous product I am now 65 and I wanted to thank you for Neurozan - I now recommend it to all my friends." "I took one course of Neurozan as an extra help for my exams. I have to say it did make a huge difference! So much so, that for my upcoming exams am planning on taking them again." "This product is different!, It is different from the usual run of the mill vitamin supplements and delivers what it says, excellent formula." "I had to write to you to register my experience with Neurozan. I have been taking the product now for approximately 2 weeks and the results are excellent so far. As someone who has struggled with their concentration and memory for many years and tried other supplements, the difference Neurozan has made to my concentration, general alertness and memory in a relatively short period of time is outstanding. My only regret is that I have only just discovered this excellent product. 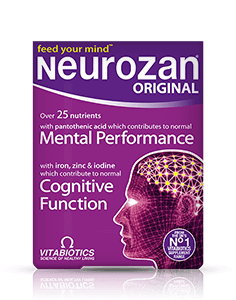 I hope to be taking Neurozan for many years to come and would thank Vitabiotics for having this great supplement on the market. Thanks once again for a fantastic product!! It is helping me tremendously." "During my preparation of bar exam I had to work and study at the same time and I have used Neurozan, and I passed the exam! I am very satisfied with the product because it helped my concentration and focus. Thank you"
"I can thoroughly recommend these tablets." "I cannot believe the difference this product has made to my life. Having suffered most of my life from what can be best described as a limited concentration span; I find myself now able to see out the most mundane of tasks without distraction, my memory recall appears to have improved as well. Truly an exceptional product." "I started taking Neurozan in preparation for my final year Law exams. I have found that since taking them my sleep has improved dramatically. I now benefit from deep, undisturbed sleep and wake feeling far more refreshed than I have in a long time." "Several hours after taking a capsule it was like being given a huge burst of vitality, i felt alert and ready to take on the world. I now take them especially when i need to think clearly and be alert." "My son is 19. He says that Neurozan helps him to concentrate and feel better. My daughterhas just started taking Neurozan and reports that it helps her to focus. Her tutor was surprised at how well she was doing the Maths that she usually struggles with. I'm going to try it myself!" "“I have been taking Neurozan for the last three months and I strongly recommend it to anyone because I can concentrate better.” "
"Neurozan is just great! I find myself much more alert.. I have recommended it to all my friends, I am interested to find out how I do in my exams!" Always read the product directions before use. Do not exceed the recommended intake. This product contains iron, which if taken in excess by very young children may be harmful. As with other supplements, seek professional advice before use if you are pregnant, breast-feeding, under medical supervision or suffer from epilepsy or food allergies. Do not take if you are allergic to soya. Food supplements must not replace a varied and balanced diet and a healthy lifestyle.